Katie Lou Samuelson added 29 points for the Huskies (22-2), who blew open a close game with a huge third quarter in which they outscored the Gamecocks 29-12. HARTFORD, Conn. (AP) — Napheesa Collier had 31 points, 16 rebounds and six assists to help No. 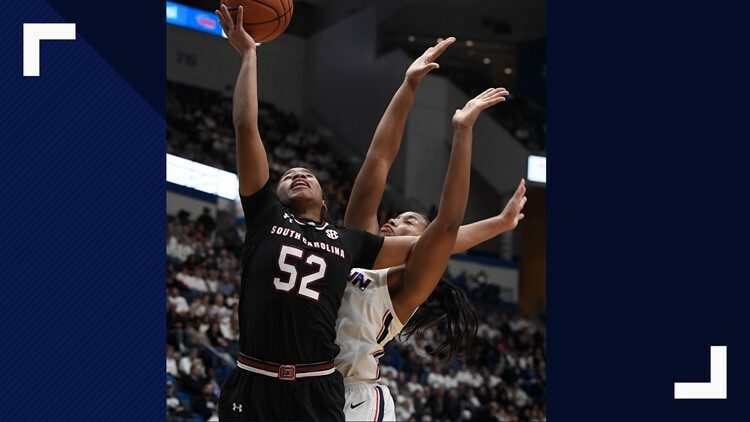 4 UConn beat 11th-ranked South Carolina 97-79 on Monday night. Katie Lou Samuelson added 29 points for the Huskies (22-2), who blew open a close game with a huge third quarter in which they outscored the Gamecocks 29-12. Samuelson scored 14 points in the game-changing quarter. Collier added eight as the two seniors continued to carry UConn. Collier has now scored 20 or more points in eight straight games and has three double-doubles in her past four contests. She left the game with just over a minute left and got a big hug from coach Geno Auriemma. UConn continued its 16-5 burst to start the second quarter and took its first lead of the game on Crystal Dangerfield's 3-pointer. The teams traded the lead for the rest of the half with the Huskies ahead 44-43 at the break. Collier had 15 points and eight rebounds at the half for the Huskies. UConn is now 8-0 all-time against South Carolina since the schools first played in 2007. The Huskies didn't go to the bench until 1:48 into the third quarter when Olivia Nelson-Ododa came in for Megan Walker. This was the Huskies' third game in six days. ... South Carolina had averaged 43 points in the paint over its previous four games. The Gamecocks were outscored 50-30 in the paint on Monday. UConn: At Central Florida on Sunday.